Home » Home Entertainment » Home Entertainment Release recap for November 16th, 2010. Home Entertainment Release recap for November 16th, 2010. 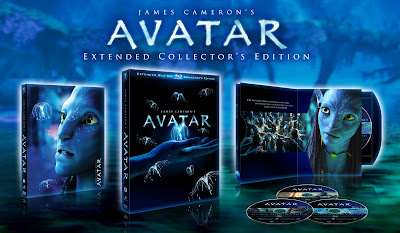 AVATAR EXTENDED COLLECTOR’S EDITION (2009) Dir: James Cameron; Sam Worthington, Zoe Saldana, Sigourney Weaver, Michelle Rodriguez, Stephen Lang DVD: $34.95, Blu-ray: $54.99 Extras: Family audio track with all objectionable language removed, “Capturing Avatar” in-depth feature-length documentary with James Cameron, Jon Landau and cast and crew; deleted scenes. Blu-ray Disc adds: Production materials; “Pandora’s Box,” which allows viewers to delve deeper into the filmmaking process; “Interactive Scene Deconstruction” that explores the various stages of production through three different viewing modes; “Production Shorts”: 17 featurettes covering performance capture, scoring the film, 3-D fusion camera, stunts and more; “Avatar Archives” including original script treatment, 300-page screenplay and the extensive Pandorapedia; BD-live Portal with additional bonus materials. (Fox). Experience the spectacular world of James Cameron’s Avatar as never before with this all-new three-disc extended collector’s edition. The journey begins with three movie versions: the original theatrical release, the special edition re-release, and the exclusive extended cut not shown in theaters. And that’s just what’s on the first Blu-ray disc. The set’s bonus feature run more than eight hours and include over 45 minutes of deleted scenes; actor’s screen tests; on-location footage; feature-length documentaries on the film’s groundbreaking production; an interactive scene-deconstruction feature that lets you explore different levels of production for 17 scenes; a comprehensive guide to the world of Pandora; and more. The greatest adventure of all time just got bigger and better. THE NIGHT OF THE HUNTER (1955) Dir: Charles Laughton; Robert Mitchum, Shelly Winters, Lilliam Gish DVD: $39.95, Blu-ray: $49.95 Extras: Commentary featuring assistant director Terry Sanders, film critic F. X. Feeney, archivist Robert Gitt, and author Preston Neal Jones; “Charles Laughton Directs The Night of the Hunter,” a two-and-a-half-hour archival treasure trove of outtakes from the film; new documentary featuring interviews with producer Paul Gregory, Sanders, Jones, and author Jeffrey Couchman; new video interview with Simon Callow, author of “Charles Laughton: A Difficult Actor”; clip from the “The Ed Sullivan Show,” in which cast members perform live a scene that was deleted from the film; 15-minute episode of the BBC show “Moving Pictures” about the film; archival interview with cinematographer Stanley Cortezl gallery of sketches by author Davis Grubb; new video conversation between Gitt and film critic Leonard Maltin about “Charles Laughton Directs The Night of the Hunter”; original theatrical trailer; booklet featuring essays by critics Terrence Rafferty and Michael Sragow. Also available on Blu-ray Disc. (The Criterion Collection). The Night of the Hunter—incredibly, the only film the great actor Charles Laughton ever directed—is truly a standalone masterwork. A horror movie with qualities of a Grimm fairy tale, it stars a sublimely sinister Robert Mitchum (Cape Fear, The Friends of Eddie Coyle) as a traveling preacher named Harry Powell (he of the tattooed knuckles), whose nefarious motives for marrying a fragile widow, played by Shelley Winters (A Place in the Sun, The Diary of Anne Frank) are uncovered by her terrified young children. Graced by images of eerie beauty and a sneaky sense of humor, this ethereal, expressionistic American classic—also featuring the contributions of actress Lillian Gish (Intolerance, Duel in the Sun) and writer James Agee—is cinema’s quirkiest rendering of the battle between good and evil. PERRY MASON: SEASON FIVE, VOLUME TWO (1962) Raymond Burr, Four-disc set, $54.99. (Paramount).